With so many new (and not-so-new, but still greatly loved) dining experiences in Disney Springs, it can be tough to decide where to make your precious Advance Dining Reservations. 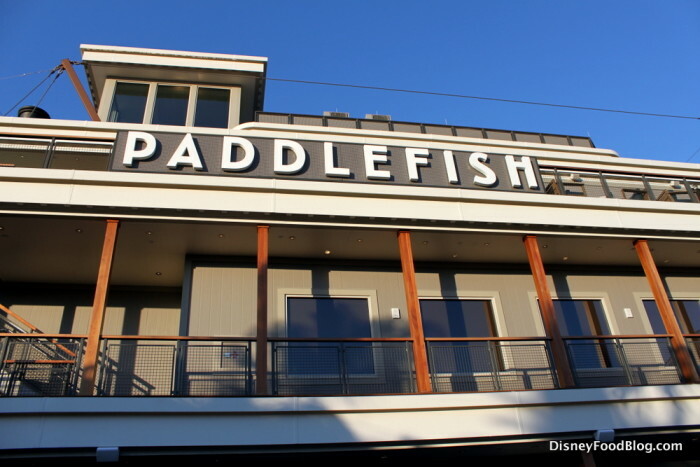 So on a recent visit to Disney Springs, I checked out Paddlefish — this time in the dining room (as opposed to the top deck bar) to get an overview of some of the menu’s most popular items. And while most of it was good, some of it was great (and one item — spoiler alert! — was just bad). Paddlefish is a brand new restaurant in an old, established building. You’ll recall that Fulton’s Crab House used to reside here, in the docked, multi-storied Empress Lily on Lake Buena Vista; and actually this spot has been a restaurant since 1977. When Paddlefish opened, guests were greeted with a combination of old and new. Neutral and trendy gray paint gave the restaurant a streamlined look, but some details of old remained, like brass railings and the fabulous sternwheel. So what do you say? Shall we paddle in? Welcome to guest author James Armstrong with a unique review of a Disney Fairytale Weddings Tasting Session! Congratulations to the happy couple! So I finally decided to make it official and ask my girlfriend Meghan to marry me. I asked her via Red Velvet Mini Desserts. Then came the question of when and where to get married. We are both huge fans of Disney World, and with her parents living in Orlando and us living in Tampa that makes Disney World about halfway in between — how convenient! We decided on March 22, 2013, as the day. 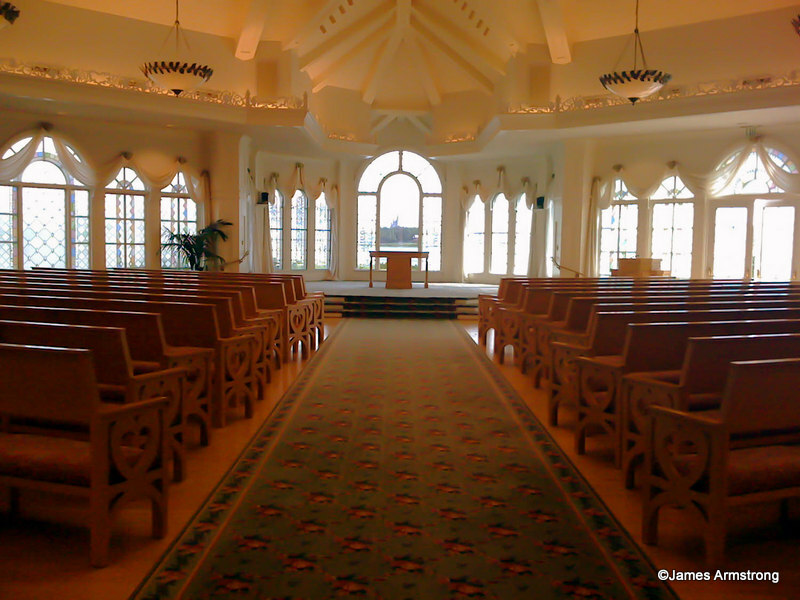 We contacted Disney Fairytale Weddings and set up a time for a site visit. We took a tour of Franck’s Studio and the Wedding Pavilion, and we were hooked on the location. After we signed some contracts and formalized the dates we setup a time to meet with our Disney Wedding Planner Christy along with Meghan’s mother and father.The planning session takes up an entire day (10am til about 6pm for us) but then the entire wedding is planned from start to finish. Our itinerary started with a private tasting in the Grand Floridian’s Event Center Kitchen at a Chefs Table. We provided a list of things we wanted to try for our menu as we were told they can do any of the dishes from around Disney — or whatever we could think of they would try to replicate. 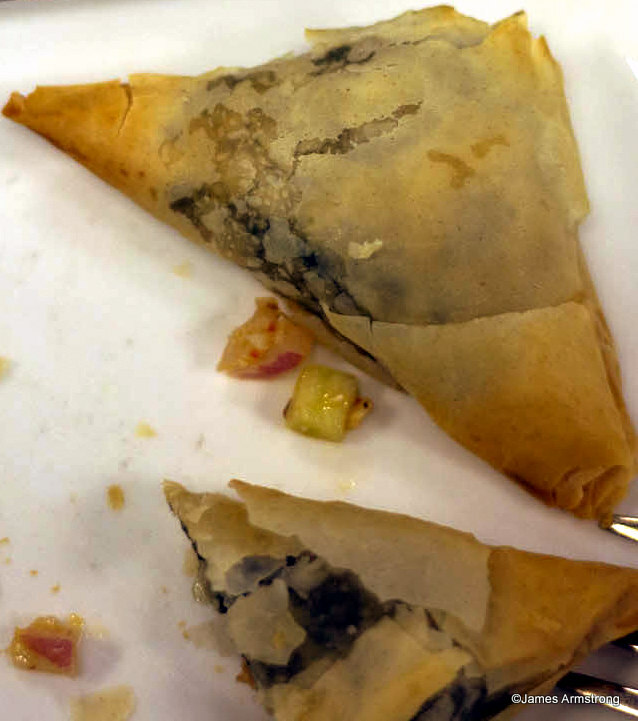 The tasting started with Spanakopita with Artichoke and Tomato Tapenade. It was wrapped in crispy phyllo. It looked so good I forgot to take a picture before I dug in. We are planning on having this as a cocktail hour offering along with an Antipasto display. For the reception we are doing a buffet style dinner. One of the nice things about Disney is that they do not even start to cook anything until around the cocktail hour, so we expect all the food to be very fresh and hot — and hopefully not your typical wedding buffet food. If anyone can do it, Disney can. Our tasting for our reception food started with a Salad Caprese. 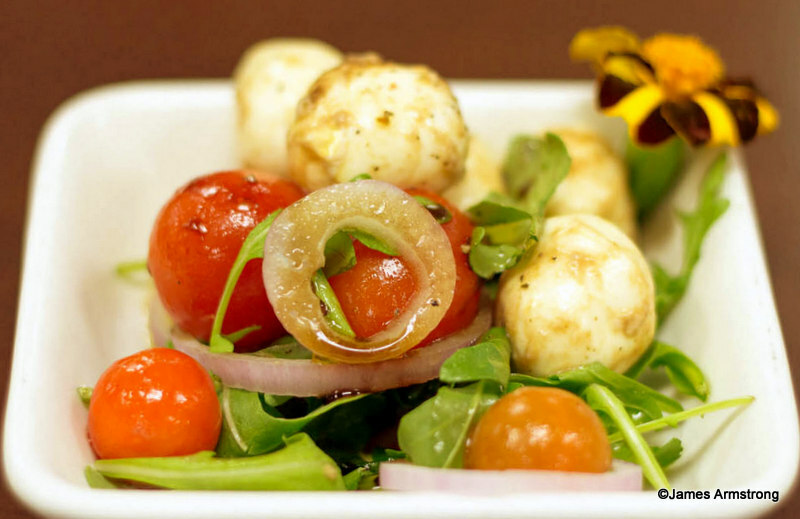 It had Tomato, Buffalo Mozzarella, Balsamic Vinaigrette and Olive Oil, dressed with Arugula, Red Onion, and Cracked Black Pepper. It also came with a little edible flower as a garnish. It was fresh and brightly flavored and a good way to start the tasting. We also tried the Truffle Macaroni & Cheese with Lobster Meat Salad. I enjoyed the Mac & Cheese more than the others, but I love truffles. It was a standard Mac & Cheese, but flavored with a hint of truffles. It was topped with some shredded lobster that was kind of like a relish, which I enjoyed. The ability to provide more nutritious meals for your children while on vacation just became a little easier! Disney has started rolling out The Mickey Check on counter service menus across both Disney World and Disneyland resorts. The Mickey Check will give parents a recognizable shortcut to identifying meals that meet the Disney Nutrition Guidelines, and expands upon the Disney Magic of Healthy Living initiative. This aims to provide nutritious options and kid-appropriate portions. The first menu to feature The Mickey Check is the brand new Be Our Guest Restaurant lunch menu, which will feature a counter service format. 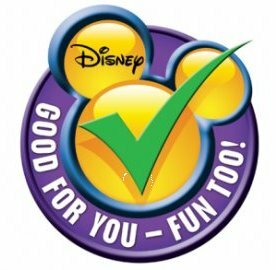 Following the U.S. Dietary Guidelines for Americans, the Disney Nutrition Guidelines also encourage the limitation of sodium, sugar, and saturated and trans fats. Recently, we drooled over these yummy Be Our Guest Restaurant food pictures from the adults’ menu at Disney World’s most highly anticipated restaurant! 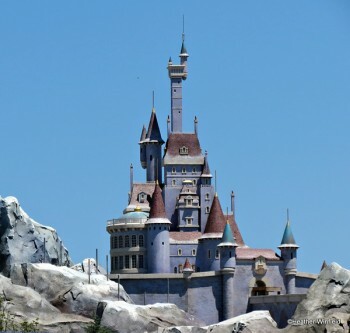 Be Our Guest Restaurant will soft-open on November 19 (with an official debut on December 6) in the Magic Kingdom’s New Fantasyland. And today, we’ve got a food photo preview of the kids’ menu, featuring grown up tastes in kid friendly flavors! 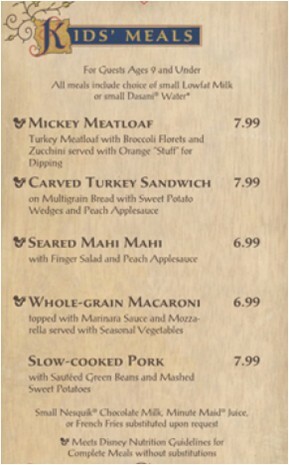 Delicious options are plenty, although the Disney chefs have not included kid-favorite chicken nuggets or pizza. Rest assured, the entrees will be appealing to kids while allowing them to dine like grown-ups. Let’s take a look at those food pics! 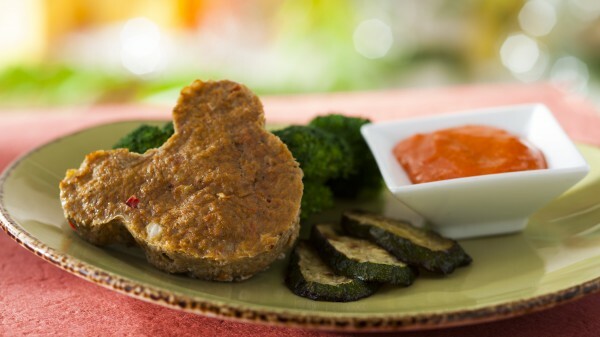 On the counter-service lunch menu, turkey meatloaf is made fun by its Mickey-shaped presentation! 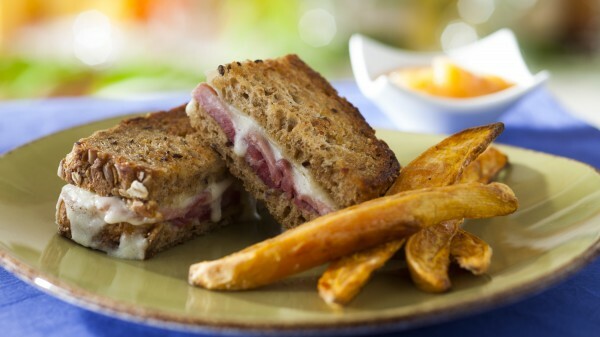 A carved turkey sandwich is served on multi-grain bread with sweet potato wedges and peach applesauce. 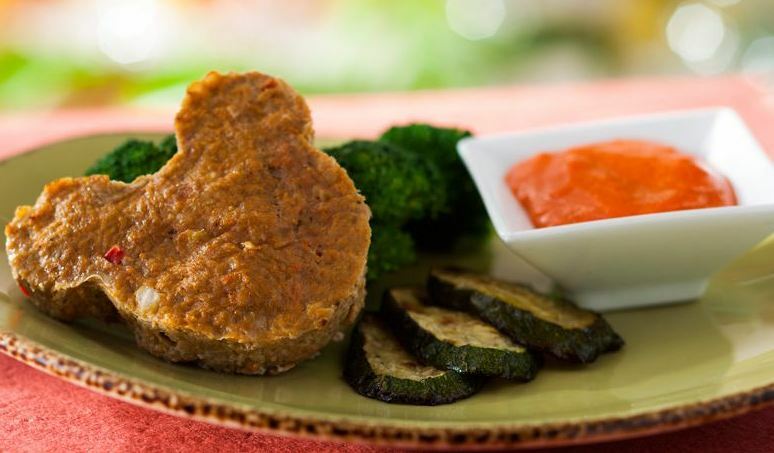 Even without fries, this dish is sure to be a kid-pleaser! Welcome back guest author Catie Hiltz with a review of lunch at the San Angel Inn inside Epcot’s Mexico pavilion. While in Disney World over Spring Break, my husband, parents and I dined at San Angel Inn, the restaurant inside the Mexico Pavilion pyramid at Epcot’s World Showcase. I have always walked by the restaurant wistfully, thinking “I wish I could eat there;” and this time, I actually got the chance to do just that! 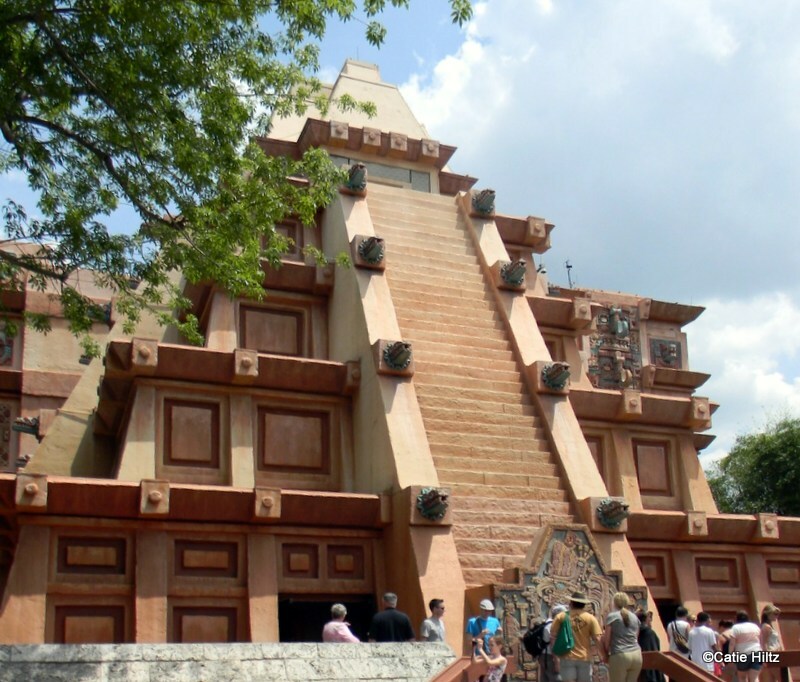 San Angel Inn is housed here, in Mexico! We arrived at 1:20 pm for our 1:30 pm Advance Dining Reservation. We weren’t seated until 1:40 pm, which gave us time to roam around the pavilion and take in our surroundings! Based on a previous guest review of this restaurant, I couldn’t wait to go try it out! 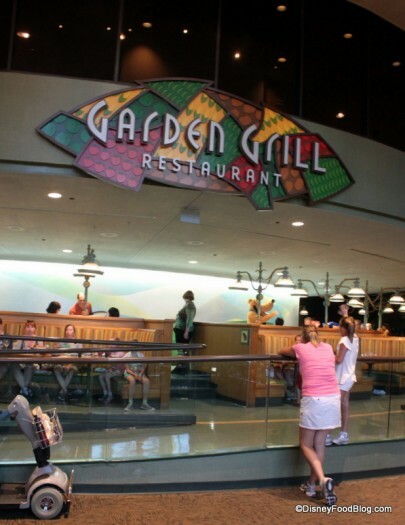 Now, to be fair, it’s not as though I’d never been to the Garden Grill Restaurant before… Well, that’s not entirely true. Before this visit, I hadn’t been to the current incarnation of the restaurant. In fact, back in the 80’s, I went to The Land Grille Room, which was what the restaurant was called before its renovation into the Garden Grill Restaurant. 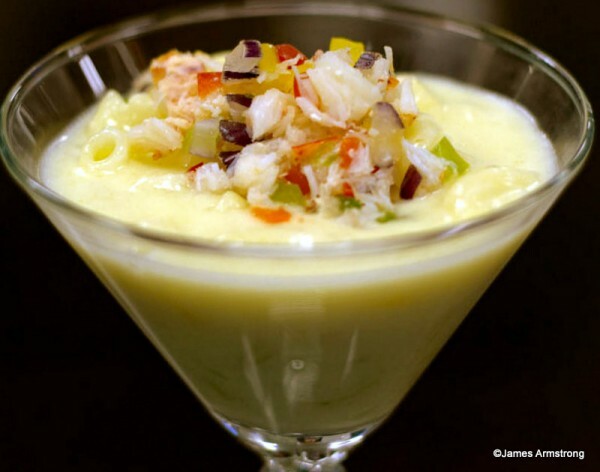 (Check out my friend Andy’s creation of a recipe from The Land Grille Room here! Born as the Good Turn Restaurant and then morphed into The Land Grille Room, this restaurant has had many personalities (my memories include dark red booths and full-blown sculptures of Mickey Mouse made out of butter). Today, it’s a family-style character dinner featuring Chip, Dale, Mickey, and Pluto! Perhaps the most impressive attribute boasted by Garden Grill is that it’s a rotating restaurant. That’s right — you go around in circles while you’re eating! But don’t worry; this isn’t as though you’re having dinner on the Teacups. 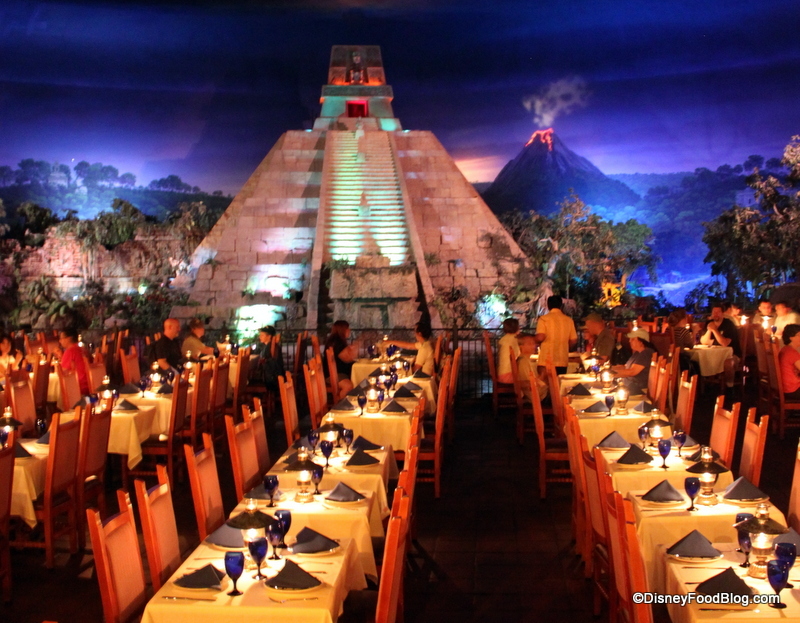 The restaurant rotates s-l-o-w-l-y during your meal, allowing views of the different scenes from the Living With the Land ride taking place below the restaurant. There are two seating styles in the restaurant, and…listen up — it makes a BIG difference where you sit. 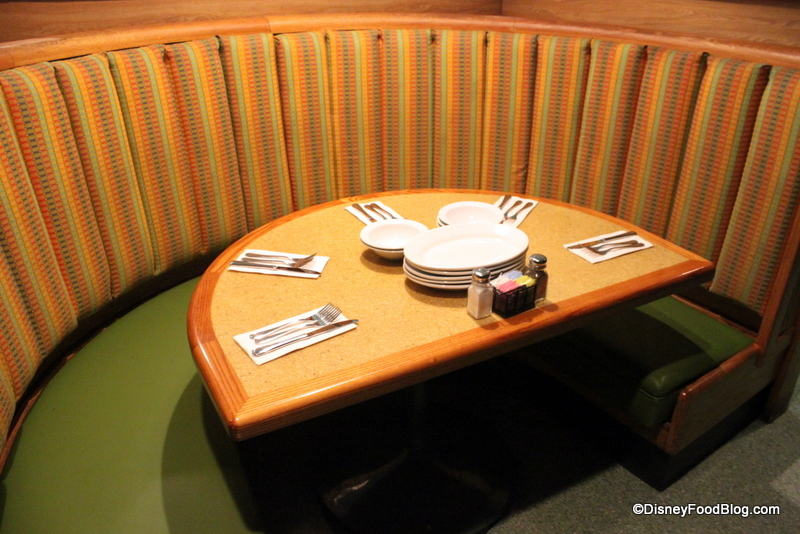 I know I’m picky about seating, but in this case, I strongly suggest that you request a semi-circular booth on the lower level of the restaurant. Thanks for submitting your photos to the Disney Food Blog Photo Extravaganza! These photographs are fantastic! This week, the Disney Food Pics of the Week feature tantalizing seafood dishes! 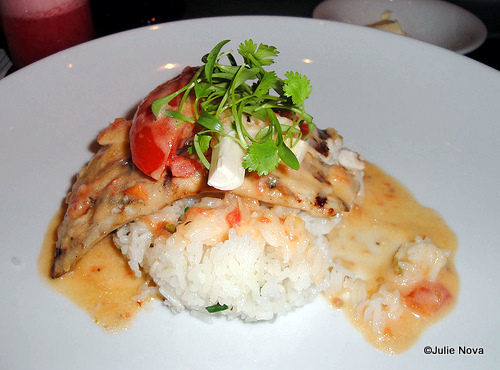 Grilled Mahi-Mahi created with ragu of rock shrimp served on Jasmine rice topped with hearts of palms at the Coral Reef in Epcot. 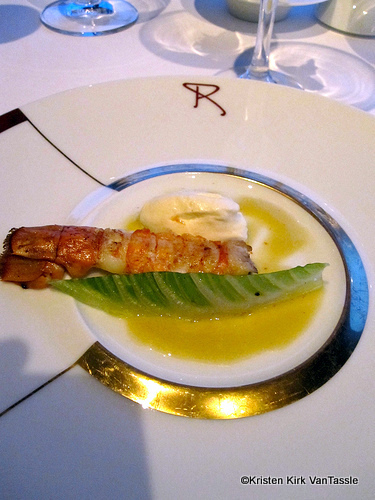 Langoustines Royale Sauce César is a Royal Norway Lobster with Caesar Sauce served at the adults only restaurant Remy aboard the Disney Dream.